← Even when things aren’t perfect, it’s a good day! I awake again to the honking of geese out on the lake. This entry is for Wednesday, September 14th. I raise the blind and see fog has completely obscured the mountains. The crew is soft and warm under the covers. They’re still asleep, but I have to go to the bathroom. Sorry, guys! Time to get up! The mountain air and lots of exercise make Bridget and Spike deep sleepers. I jump into some clothes, put Bridget and Spike in their black suits, and we’re on our way. I’m glad I didn’t give away my winter coat. There’s a slight rain and it’s cold, so I put the hood up. Back at the Casita, I turn on a burner to heat water for tea. The crew go back to bed. I’m surprised how the one burner takes the chill out of our little home. After a bowl of cereal, I go back to bed, too. I had considered leaving today. It doesn’t seem like a day for travel. Oh, let it rain and later the sun might burn off the fog. I’m going back to sleep! Around 11 o’clock we ride over to Angel Fire. I want to go to the library for internet access. I wonder if the town would have the same mystique if it were named Pigville. I doubt it! Eagle Nest is another great name, easy to market. For a brief period in its history it was called Therma. Not quite as inviting! Bridget and Spike don’t usually like to be left alone in the PTV. Today is so damp that they appreciate the heater and don’t put up the fuss like yesterday. The librarian recognizes me with a good morning and I settle in at the back. It takes me about two hours to do emails, read comments, make blog entries, and post photos. When I come out of the library, the sky is blue and the clouds are white! Wow! I never expected this! Back at camp I take the crew on a walk down to the fishing area. About seven or eight boats went out today. I’m hoping I’ll hear about what fish have been caught, but anglers are either out in their boats or sitting down below along the shore and I don’t want to bother them. We watch them for a few minutes. Thinking about freshly caught salmon almost makes me want to take up a rod and reel again. Not that I was ever good at fresh-water fishing. I did okay fishing salt-water in Florida . . . once upon a time, long ago! I think about hitching up tonight to get an early start. I don’t even know where I’m going yet! And after a long walk with Spike and Bridget, I’m too lazy to hitch up. I’m glad no one’s keeping track! 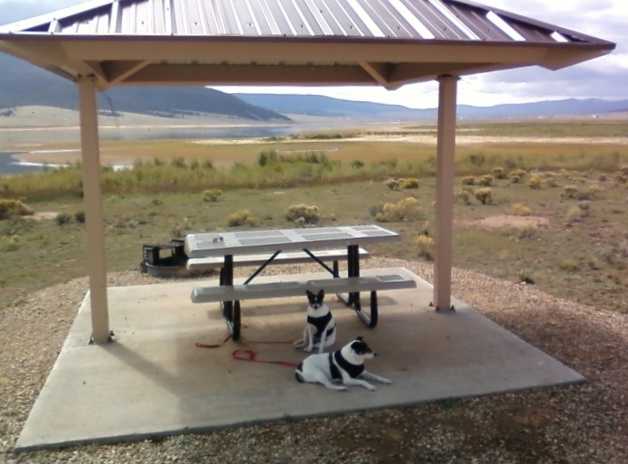 This entry was posted in Bridget The Widget, Casita, Simple living, Spike The CoPilot and tagged Angel Fire, campground, camping, casita, Eagle Nest, New Mexico. Bookmark the permalink. Sounds like you did exactly what I would have done. Sleep in and then see if the weather improves. It’s no problem to hitch up in the morning when you’re not planning to drive a long distance. When you’re going a long way is when you want to get a really early start. Do you have a general plan or are you just winging it……………..totally. Are there things you want to get done before winter?? What is the winter plan?? I don’t really know what I’m doing! I’m winging it. I would like to stay in NM for the winter, southern NM of course. It’s inexpensive living and I want to explore it throughout the year, so I’m not wanting to run off to southern Arizona (more expensive). It gets cold in southern NM . . . snow and some freezing temps. I want to have a Wave3 propane heater installed. This heatstrip is great but it won’t be able to handle really cold temps. I hate to be a harbinger of doom….but you might want to start checking into avg low temps in southern new mexico …I just checked Las Cruces and Deming….both of them have 5 months over winter which have average lows below or near freezing…..will you be able to keep your casita warm enough to protect your water pipes? You may have to consider Arizona or South Texas….. The Casita pipes, although somewhat exposed, can handle temps where the lows are at or near freezing as long as the temps don’t STAY below freezing more than a few hours. I would check out NM state parks that have electric hookups so you can use a small cube heater. Pancho Villa, Bottomless Lakes or Rockhound would be three possibilities. We didn’t “winterize” our Casita the first two winters we had it here in the DFW area. Last winter we winterized when the temps were to be WAY below freezing for several days. 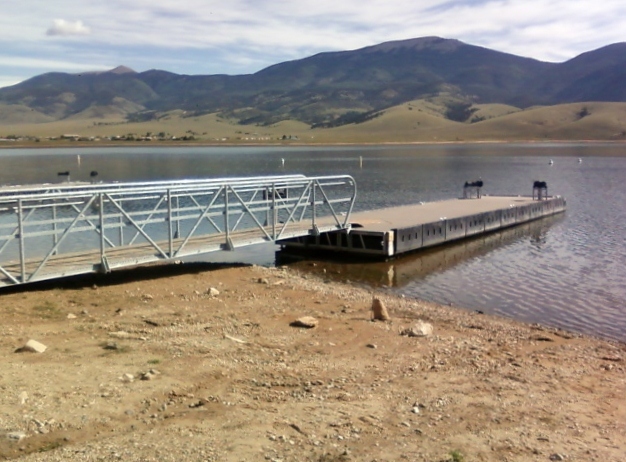 Have you considered the LOWs park in Deming? I think the rates are reasonable, but it’s certainly not as private as boondocking. There are a number of state parks close by…Rockhound, Pancho Villa, etc. It does get chilly, though. We are not RV Park people but have stayed at both Rockhound near Deming and Pancho Villa in Columbus. Rockhound has a nice view and there is a scenic loop trail circling the campground. Pancho Villa in Columbus allows you to visit the Pink Store just 3 miles south of the campground at the Mexican border…in Mexico. The Pink Store is an experience in itself. Columbus is a quaint little town with a unique history. If your looking for a Park in that area where you will have some space I would recommend City Of Rocks State Park just south of Silver City. Beautiful rocks and you can get out and boon dock in and around them. They also have small electric and water sites but of course your jammed in beside other rigs. If you type in the names of any of these places into our search bar at the top of the right hand column in blog you can find my posts and photos from these places. Thanks everyone for weighing in on this subject. I’ll do some research on line and talk to people in southern NM. I don’t mind putting up with some cold and snow, as long as it isn’t extreme . . . but I do have to consider my trailer.